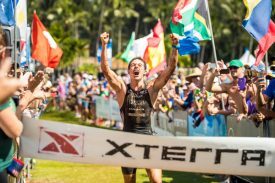 Mauricio Mendez, 21, from Mexico City, Mexico and Flora Duffy, 29, from Devonshire, Bermuda captured the XTERRA World Championship off-road triathlon elite titles on a wild, windy, and muddy day in Kapalua, Maui on Sunday..
October 23, 2016 (Kapalua, Maui, Hawaii) – Mauricio Mendez, 21, from Mexico City, Mexico and Flora Duffy, 29, from Devonshire, Bermuda captured the XTERRA World Championship off-road triathlon elite titles on a wild, windy, and muddy day in Kapalua, Maui on Sunday. In the men’s race Mendez posted the fastest run split of the day (42:06) and passed three-time XTERRA World Champion Ruben Ruzafa from Spain with one-mile left in the run to take the tape in 2:49:38. In the women’s race Flora Duffy led from start-to-finish and posted the fastest swim, bike, and run times to take the win in 3:14:59, more than 10-minutes ahead of runner-up Lesley Paterson from Scotland. It’s Duffy’s third XTERRA World Championship win in a row, tying Julie Dibens record of three straight from 2007-09. Both Mendez and Duffy earned $20,000 USD for their respective victories. The total purse was $100,000, and the event was filmed for international television distribution. More than 800 endurance athletes from 46 countries participated in the event, which started in the rough waters of the Pacific Ocean at D.T. Fleming Beach, continued with a 20-mile mountain bike that traversed the West Maui Mountains, and finished with a grueling 6.5-mile trail run. There was more than 4,000-feet of combined climbing on the bike and run courses, and the mud from recent rains turned a fairly technical course into a “matter of survival” said competitor after competitor. 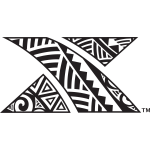 For Mendez and Duffy, due to the rough conditions in the water and on the trails, their winning times were the slowest in the history of XTERRA Worlds. So a 21-year-old (his birthday was on Thursday) won the 21st annual XTERRA World Championship. Mauricio Mendez, affectionately known as “Mau,” started swimming when he was six, doing triathlons when he was 10, he did his first XTERRA when he was 14, won the overall amateur XTERRA World Championship when he was 18, went pro as a 19yo, won his first pro race this summer at XTERRA Italy, and now he’s the XTERRA World Champ. Mendez was third out of the water, worked hard with Leo Chacon on the bike to catch Courtney Atkinson at mile three, then he caught Ben Allen at about mile six and those two were together for the rest of the bike. Ruben Ruzafa caught them at about that same time and rode away, coming into transition with more than two minutes. Mendez, who had the fastest run last year by more than one-minute over Middaugh, had the fastest this year by just 41-seconds over Braden Currie but it was 3:41 faster than Ruzafa. Ben Allen came off the bike in third and stayed there. It’s the third time in four years Allen has finished 3rd here at XTERRA Worlds. Currie and Middaugh came off the bike together at T2, both caught Leonardo Chacon, with Currie finishing fourth and Middaugh in fifth (and top American for the ninth time and fifth time in a row). Just a few weeks removed from upsetting Olympic gold medalist Gwen Jorgensen to win the ITU Grand Final in Cozumel and ITU World Triathlon Series title, Duffy put her name in the record books with her third straight XTERRA crown. Duffy, who finished 7th in her first XTERRA and said she’d never do another, says she’s happy that she did. For Suzie Snyder, who finished in third and top American, it was the culmination of her best year as an elite. Myriam Guillot-Boisset finished fourth for the second straight year, and Helena Erbenova finished 5th for the second time in three years. My first XTERRA was in 2010 in Mexico, in the junior kids race, and I won it. And I remember Dan Hugo was first place at the time and thinking wow, this is amazing, I want to be like him. And I just get into it and from that day I dream about being the world champion. I don’t know, I feel like I am still sleeping or what. Ruben told me he was happy that I was the one beating him. That was an amazing feeling. Like one of the biggest feelings ever, for someone like him telling me that was kind of a big deal for me. There’s something really special about XTERRA for me, it’s a true passion. I had all the momentum from my life, I felt amazing. I was really tired, but something switched in my mind one-mile before the finish and it clicked. I saw Ruben and I just attacked, and was able to sustain it through the finish. I got on the beach with the lead and I didn’t know what to do, should I celebrate, should I cry, what should I do? It was really, really tough out there today. I used a lot of energy in the swim so I was more tired for the bike and the run. I didn’t know it was Mauricio behind me, not until he passed. I thought I was running well, but I then I was having a lot of cramps, so just tried to survive. Mauricio was really impressive today, especially because he has improved a lot on the bike. I’ll have to study this race today to see where I need to improve for next year. I got out of the water in second. I just got dumped on the last little section coming in. I took a boomer and it just pummeled me into the sand. You know, you gotta have fun out there. It’s serious racing, but at the end of the day, it’s all about enjoying yourself. I had a great time today. I absolutely enjoyed it. I love this sport. I am so happy for Mauricio, what a superstar. Beating Ruben Ruzafa, he’s got huge credentials. For me to get myself back on the podium, after a disappointment last year, I wanted to come here and show everyone and my sponsors what I can do. I’m in for the long haul, so I’m going to come back and have another crack to see if I can get out of this third place spot. All in all it was a good day. I had a bit of bike trouble. I had a couple of mechanicals on the bike. My coach said to me it was going to be a race of emotions. Don’t let your emotions get ahead of you. If something goes wrong, just control yourself, think about what you need to do and carry on. That really helped me today. I had a couple of issues, crashed a couple times. Everyone’s got a story. I was able to stay positive and keep moving forward. I finished third against these two superstars, I’m proud to be on the podium. On the last two or three K, I was just stinging, my whole body was just aching. I was praying that no one was behind me. The bike course really took its toll, the mud was so tough and grueling. It’s probably one of the toughest races I’ve done in my XTERRA career, and I’m just proud to get on the podium and finish with a solid result. It’s hard to get past the mud in France. France has one of the toughest courses around because of the climbing and the mud is just thick and deep. Here the mud is slippery and you need to choose a good line and get to the edges as best you can and know the course because every inch you can get is a huge advantage for propelling yourself forward. It’s definitely one of the toughest courses on the circuit. Judy Abrahams, the XTERRA Warrior from Friday night, really inspired me. You have days where it’s tough and you just got to fight a little bit harder. Things always do get better. That really stuck with me. It made me think about why I’m here, why I do this sport, why I love it. My family is so evolved and passionate to help me with my dreams and goals. I’m just so glad I could come here today, show my sponsors and family and friends that with their support, love and care that I can do it. It was a lot of fun, a huge amount of fun. It was just one of those days. You just keep battling and nothing seemed to be going smooth. I lost my gears for quite a while. Josiah caught me up and we were just flailing around on some of the corners. I felt pretty good, but I just didn’t have enough. I didn’t know Mauricio would bike like that. I think the course, the conditions sort of played a little bit to his favor as well. Obviously Ruben was getting traction, but a lot of us were struggling to get power. You just ride consistent, and it was really hard to make time. I had a terrible swim. I don’t know why. I just couldn’t get my form and I was so disoriented in the swim that I was sighting all the time because I could even see. I had like a motion sickness in the water. I was just getting tossed around, but it was the same for everybody. It was a rough start for sure. Mostly just mentally at that point. It threw off probably the first five miles of my bike. I was behind a lot of people, I was making all the mistakes that they were making. I lost a lot of time early. It was just hard to battle back. You were battling the conditions, the bike is packed up with mud, I had to stop and pull stuff out. And then I threw my chain into my spokes, twice, and it took me a minute to get the chain out. The derailleur just stopped working at some point and I had a couple of gears to choose from. It was just a battle all day. I was happy I was able to stay in it, keep working up, but I knew I was losing gobs of time at the front of the race. I came off the bike with Braden. We ran together for about two miles. Then I could see Leonardo Chacon, but it took me a long time to catch him, and when I did, he stayed with me pretty much. I wasn’t putting much time on him at all. And he was right with me at the finish. I’m super happy for Mauricio. I mean, amazing. He really surprised me today that he was able to ride like that in the mud. He was the champion today. We knew it was just going to be a mess out there. Those top guys were really going to be shaken up. It was kind of anybody’s day. Conditions like this mean it’s wide open, but Mauricio had it today physically and mentally. The conditions made it a long race, and I got a little behind with nutrition. It wasn’t the same feeling as last year. Last year I’m pushin’, pushin’, pushin’, and now I’m just hanging on a couple notches back. It was crazy man. Seriously the craziest race I’ve done in XTERRA, ever. It was insane. It was fun, but it was a little disheartening because I had a mechanical around mile 13, I was riding with Josiah, and I couldn’t get any gears. I just started pushing my bike up all the hills. I mean, I kept fighting, I am happy I can take the double again. It was a really hard fought battle. I was nervous all day that someone would run me down or something. I had a pretty strong day all around. I had to get a wave to beat Benny out of the water. Benny was on fire all day, but wow, that was hard, with the mud and a lot of conditions. You couldn’t put a lot of power down on the bike. There was a lot of finesse. Some guys go past and you’re like how are you riding like that. It might have been about tire choice and mountain bike skills. You have to ride or you’re never going to make it in Maui. Only got a couple guys on the run. It’s really the same as other years, because the bike is so long, it’s hard to utilize the run properly. By that stage, it makes it pretty flat. These swim conditions took me back to my junior days. I cracked a pretty decent wave at the end, so I was happy. For me this race in Maui, we may as well start the bike altogether. It’s a ride race. In ITU, they call it a wet run, here it’s a wet bike. It was so tough. I just can’t believe that we rode through that course today. It just took so much power out there. A lot of the time, the back wheel didn’t do much. I think it was just trying to pick your line and keep rolling with it. I was just glad to get off the bike safe and sound. I felt strong today, so thank goodness. I guess I have to come back next year to try to get four. It’s pretty cool to win three in a row. Julie and I were chatting about it the weeks leading up to the race, so I guess she has to come back and face me next year. We’ll be neck and neck out of the swim. She’s great. She’s an athlete I really look up to. It was brutal out there today. Mother Nature just wasn’t playing kind. The surf, the wave was huge, the biggest I’ve ever seen. Super choppy out there which was great for me. I love choppy waters, so I knew I had to capitalize on that. I came out with a decent gap, I was in the lead so I didn’t really know, but I just kept pushing and tried to ride as technically well as I could. There’s a lot of on your bike, off your bike, hike a bike. You’re riding a long and next thing you know you lose a front wheel, you’re down, just mud caking my bike. The rain we got this week just totally changed the course. A relatively smooth, not super technical course just became treacherous. Definitely learned a lot about yourself out there. When I first started racing XTERRA it would have been the last thing I would have ever expected to achieve so it just shows that if you put the work in, you can learn. Dan has basically opened the door to XTERRA and taught me everything I know and I owe him so much for getting me to this point. I knew Lesley would be charging you know. She is relentless and one of the toughest competitors, so you never know with her. You might have a couple minutes gap but she can close that, so you just have to keep pushing and thankfully I got a few splits out there and just tried to focus on my race, stay smooth, and stay on my bike. It was a tough, brutal day out there but I’m pretty pumped. It was hard for everybody you know, and I think you gotta keep pushing, you gotta keep controlled, you gotta keep patient; all of those things. You gotta know that when you’re getting off the bike, so is everyone else. When your gear’s not working, probably everyone else’s gear’s not working. You know, you’re always kinda fighting. But you know at the same time, it’s all part of it. Flora was phenomenal today. Yeah, there was just no way. After that swim there was just no way. I mean I knew that I came out of the water and it was 5 ½ minutes. I was like “that’s not good,” and it really exhausted me that swim. I got held up there a couple times and had a couple panicky attacks. And I’m running out on the beach you know and just feeling just like really wigged out. And I got on the bike and just never got in a rhythm. Body in general held up really well. I was really chuffed and I got on the run and actually felt sort of quick so that was the easiest part of the race I’d say. Only in so much as it wasn’t so muddy by that point. And I seemed to be more in control of the elements. (On Mauricio Mendez) He’s been my little prodigy cause we got together and I started coaching him a few years ago now. And I don’t coach him anymore but he’s been a big part of the Braveheart family because he’s just the most wonderful guy. You know, just so passionate. He is XTERRA. Like truly. His passion, his excitement, his love, his commitment, his determination. And he’s got talent, loads of talent. On the run I felt pretty strong initially then going up that steep climb, I think going up to the lake, where it gets kind of steep, I was hurting. My legs were cramping, and I just tried to turn over and recover on that downhill. I just tried to keep moving as best I could without blowing up. It’s all about pacing yourself to some extent. I slipped off the bike a bunch of times, but no crashes per se. I kind of can’t believe this whole year. It just feels awesome to know I worked really hard for it and I think the crash and coming back made me a lot tougher mentally as well as physically. I’ve worked really hard and I’m just really proud of myself for pushing through a lot of the hard times. It’s awesome. Xavier Dafflon (pictured) from Switzerland finished 17th overall and was the top amateur in 3:08:35, almost one-minute in front of Loic Doubey from France. Lydia Hale from New Zealand finished 16th overall and was the top amateur woman in 4:12:02, followed by Courtney Kaup from the U.S. in 4:21:37. Colorado’s Ben Hoffman (pictured) won the Outrigger Resorts Double for the second straight year today. He was 4th overall in Kona and 7th in Maui. Sebastian Kienle went about three minutes faster in Kona, but Hoffman was about six minutes faster here in Maui for a combined time of 11:14:41. Pablo Ureta from Cordoba, Argentina won the men’s amateur double (9:37:49 IM + 3:38:13 XTERRA = 13:16:02) and Virginia Sellars from Vernon, B.C., Canada won the women’s amateur double (11:34:44 IM + 4:50:12 = 16:24:56). The XTERRA World Championship was presented by Paul Mitchell, the Maui Visitors Bureau, XTERRA TV on Amazon Video, Outrigger Resorts, Hawaii Tourism Authority, XTERRA Travel, Muscle Milk, Gatorade Endurance, PowerBar, Optic Nerve, XTERRA Wetsuits, XTERRA Fitness, XTERRA Boards, Compex, Greenlayer, The Ritz-Carlton, Kapalua, Kona Brewing Company, and Cycle City.